It's been quite grey today, but mild for the time of year. A walk in Pearson Park gave a few nice surprises. Autumn is fully fledged: conkers on the ground, a rich brown carpet of leaves. Although most of the trees are still green, there are many branches with first tint or brown leaves. The Grey Squirrels were calling, chasing and busily burying goodies in the ground. A small flock of Common Gulls are back in the pond after returning from their breeding grounds. 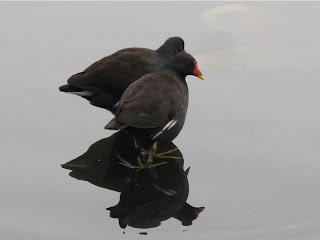 The pair of breeding Moorhens now sits together preening each other; the two grown juveniles nowhere to be seen. 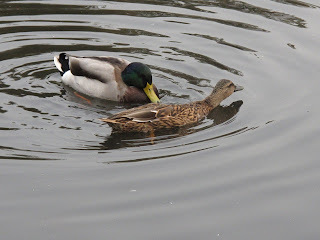 Male Mallards are showing off their wonderfully bright new feathers. They are boringly common, but what beautiful birds they are. One male and female were courting, heads quickly bobbing. The female lowered its head and the male mounted her. Everything was over very quickly. 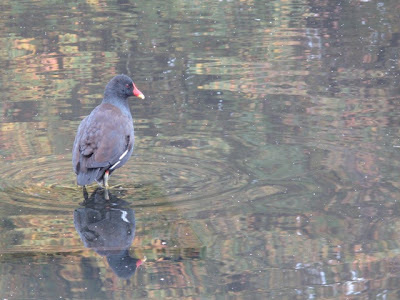 The female fluffed its feathers and flapped her wings over the water at the end. There was a hybrid Canada-greylag goose with 5 Canada geese, paired to one of them. It looked a bit clumsy, but it had a good session bathing itself. 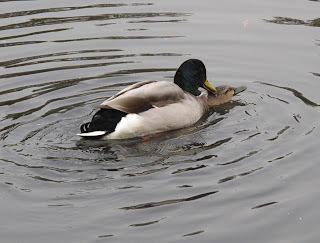 Given the strong imprinting of Ducks and Geese to the adults tending them, hybrids are likely to result of nest parasitism (one species lays egg on another's nest) or brood amalgamation (a pair of one species 'fosters' a brood from a different species and they grow together. The individuals of the fostered brood become imprinted to the 'wrong' species and when adults pair with it producing hybrids. One of the parents of this hybrid -most likely a greylag- was likely to have got imprinted to Canada Geese and paired with one. 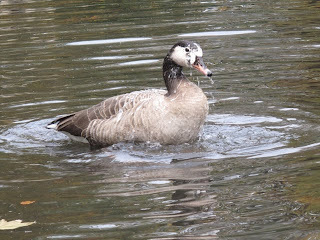 See this article and this website for fascinating info and photos on hybrid geese.